Visual Studio Code>Other>TsAutoReturnTypeNew to Visual Studio Code? Get it now. 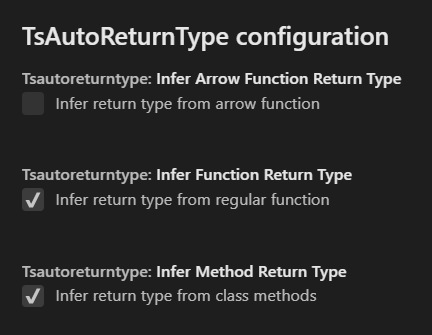 Automatically print inferred return on your function. Stop writing the return type of your functions by yourself ! If TypeScript can infer a type, it will be printed for you ! At the moment, TS-Auto-Return-Type work only usings commands. Fill free to leave issues or pull request on this repository.